The Land Prints project was selected for the Theme Issue 2-2014 on Landscape Specifics by the Journal of Landscape Architecture / JoLA. The prints will be featured as part of the journal’s peer-reviewed Thinking Eye section and on the issue’s cover. 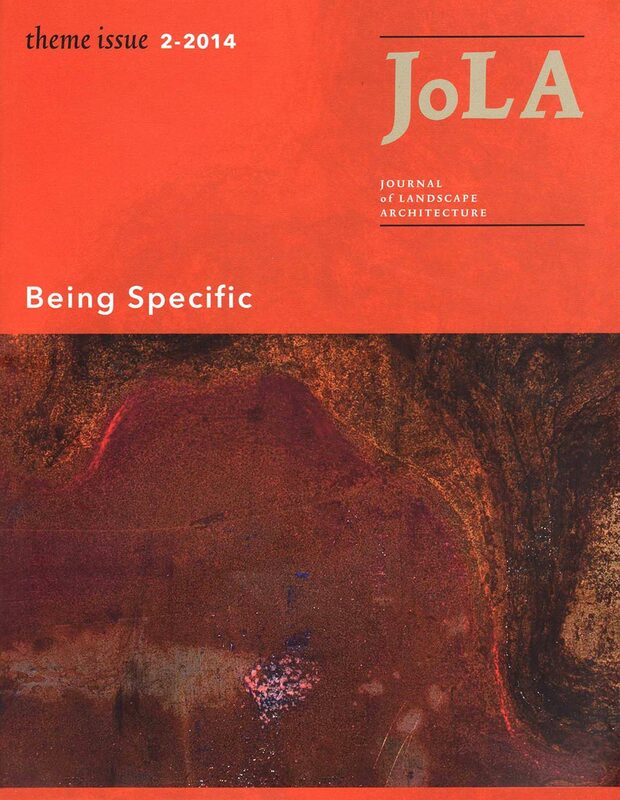 Established in 2006, JoLA is the peer-reviewed academic Journal of the European Council of Landscape Architecture Schools (ECLAS). JoLA is published by Routledge, Taylor and Francis Group, and listed in the Web of Science, Thomson Reuters Arts and Humanities Citation Index and other relevant indices. JoLA has three issues a year, is published in full colour, on paper and online. 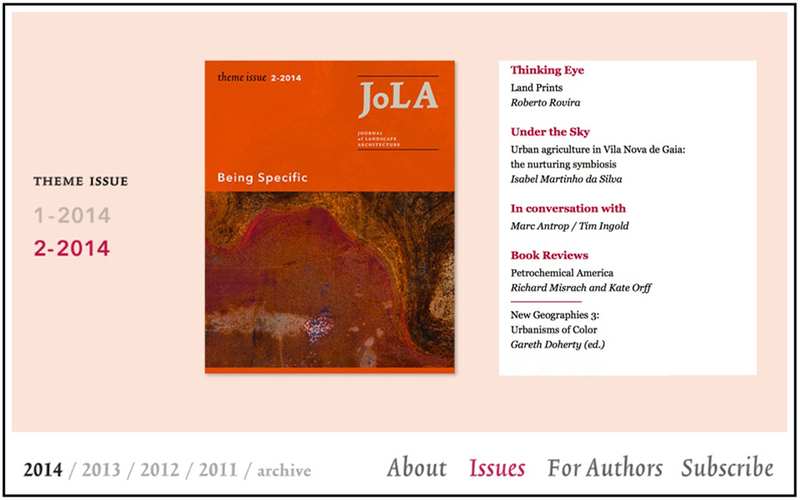 Cultivated through editorials and reviews, and a unique approach to the graphic design of its content, the aims of JoLA are to provide a platform for outstanding landscape architectural scholarship and research innovation, linking theory to practice. While publishing articles following established research conventions and written modes of communication JoLA also encourages and publishes unconventional and emerging forms of research inquiry including those employing practiced-based methodologies, those having their origins in visual and artistic practices and media, and those espousing new method and rigor for the developing field of landscape architectural criticism. JoLA thus gives space to the reflective practitioner and to design research. The Journal is considered notable in its positioning at the nexus of landscape architecture practice, research, design, and education and in the attention paid to visual presentation and publication in full colour. JoLA is unique in the space it gives to the reflective practitioner. Under the Sky and Thinking Eye explicitly underline the importance of the creative imagination and promote the thoughtful review of canonical projects and experimental representation as forms of thinking worthy of scientific endeavours. Finally, JoLA features a wide range of interdisciplinary articles in design-based research and research-based design, unified through rigour in the discussion of landscape issues. Landscape academics and professionals with an interest in the application of history, theory, and criticism and in the realization of built projects through expertise in fields like design, ecology, urbanism, landscape management, and horticulture find JoLA a valuable resource. JoLA’s inclusion in the Arts and Humanities Citation Index is an especially significant validation of the research of past contributors and also provides an incentive for future submissions, as many universities use such indices as a measure of research impact and effectiveness. The journal has different sections in order to accommodate and cultivate this, among them the ‘Under the Sky’ and ‘Thinking Eye’ sections, explicitly underlining the importance of the creative imagination and promoting the thoughtful review of canonical projects and experimental representation as forms of thinking worthy of scientific endeavors.